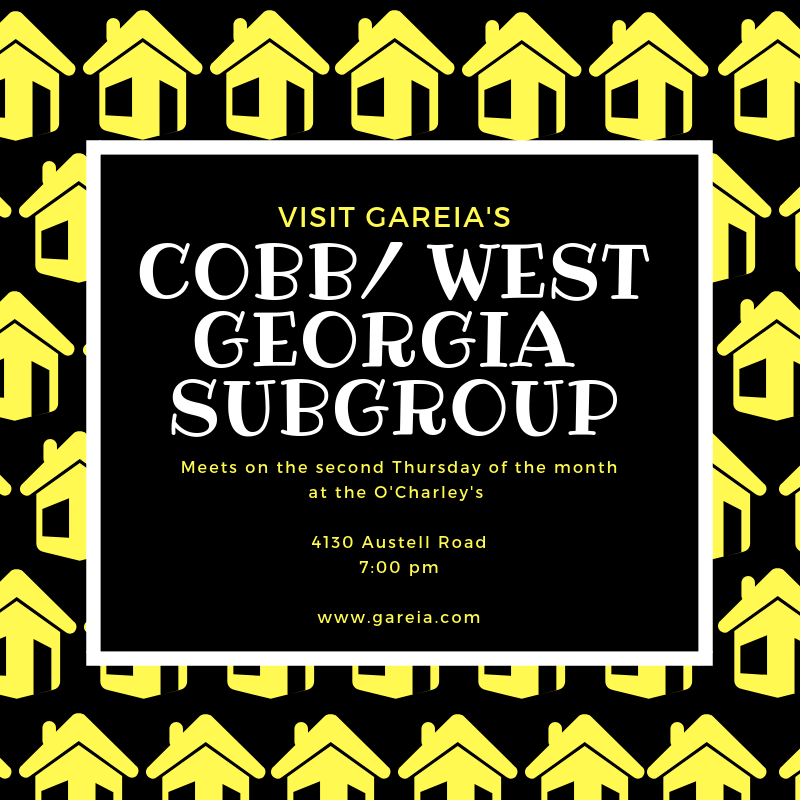 We meet at the O'Charleys, 4130 Austell Road, Austell, GA 30106, at 7 pm, on the second Thursday of every month. Members attend all Subgroups free of charge as a GaREIA Member benefit; Guests attend all Regional Subgroups free of charge (Southside, Cobb/West GA, Intown Rehabbers, Northside Rehabbers, Gwinnett, Venture Capital), and may attend any one Subgroup that meets at GaREIA Headquarters free of charge; subsequent visits to any Subgroup that meets at GaREIA Headquarters require $25 Guest Fee. Online registration runs through 5:00 pm the day of this event; after that time, you may register at the door. First time Guests should register at the door. Payment Details: Members attend all Subgroups free of charge as a GaREIA Member benefit; Guests attend all Regional Subgroups free of charge (Southside, Cobb/West Georgia, Intown Rehabbers, Northside Rehabbers, Gwinnett, Venture Capital), and may attend any one Subgroup that meets at GaREIA Headquarters free of charge; subsequent visits to any Subgroup that meets at GaREIA Headquarters require $25 Guest Fee. Online registration runs through 5:00 pm the day of this event; after that time, you may register at the door. First time Guests should register at the door.